It’s the biggest and busiest festival in Cheung Chau. What originally started out as a celebration for the end of the plague in Cheng Chau has now transformed into one of Hong Kong’s most famous festivals and an important celebration of our cultural heritage. 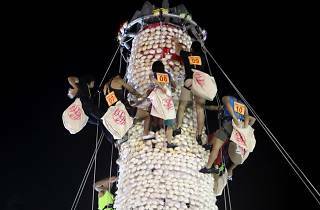 The festival lasts almost a week-long, kicking off from Sunday leading up to the lively and colorful traditional parade and the iconic Bun Scrambling Competition, where participants climb giant 60-feet bamboo towers covered with buns and try to grab as many buns - yeah, we know how that sounds - as possible. Thousands of people descend to the tiny island for the festival, make sure you check out the colourful display of papier-mâché deities, signature massive baking buns and bamboo towers.